The goal of any orthodontic procedure is to align the teeth to ensure proper function and proper aesthetics. 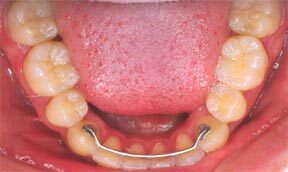 Please browse through our orthodontics gallery to see the types of results that can be achieved with orthodontic treatment. The average treatment time for orthodontics is between eighteen to twenty-four months. However, the length of treatment will depend on the severity of the pre-existing condition, the type of treatment (removable appliances usually takes longer than fixed appliances) and the cooperation of the patient. 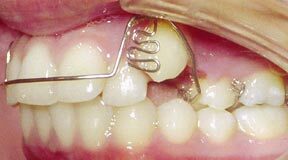 At the completion of the active part of orthodontic treatment, the braces are removed and retainers are made to keep the teeth stable in their new position. 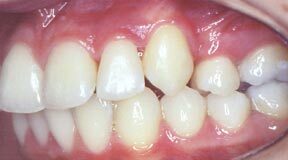 These appliances may be removable retainers or fixed wires that are placed behind the teeth. 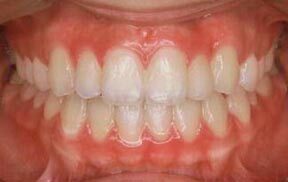 Retainers play an important role in orthodontic treatment since teeth tend to rotate and move toward their original position. 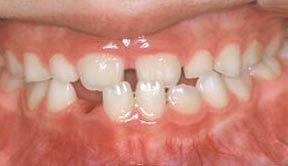 This case involved the front top teeth overlapping the front lower teeth too much, which caused the front lip to protrude. This is evident in the top photo, in which you can barely see the lower teeth. In the lower photo, you can see how the angulation of the front teeth is excessive. After about 18 months of treatment, the top teeth have been moved back and up. In the top photo, you can see more of the bottom teeth and the alignment of the teeth looks appropriate. In the bottom photo, you can see that the angulation issue has been resolved. The result was a confident and happy patient. In this case, the front four top teeth are in a crossbite, meaning they appear behind the front four bottom teeth. The other issue is that the position of the cuspid, or canine tooth, needs correction. Through the use of fixed appliances and 24 months of braces, all of the issues were corrected. 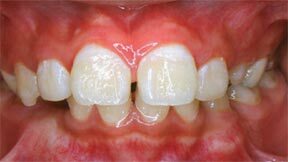 The front four top teeth now appear in front of the front four bottom teeth and the cuspid has been brought back into proper alignment and it is now a functional tooth. In this case, the cuspid on the right side of the photograph is sticking out and the tooth next to it is behind the front tooth. The bottom teeth are also out of alignment. Fixed braces were placed and results were achieved in 18 months. All of the teeth are now in proper alignment and are fully functional. The yellow arrow is pointing to a lateral tooth, which is in crossbite. Crossbite means it is behind the bottom tooth, rather than in front of it. 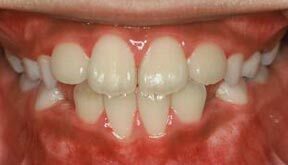 These results were achieved in 12 months through the use of fixed braces. You can now see the tooth that was almost entirely hidden. This is an example of a crossbite in a child. The two center teeth on top should be in front of the two center teeth on the bottom, but in this case they are behind them. Fixed braces were applied and the crossbite was corrected in 6 months. This is a crossbite involving the front four top teeth, which are misaligned behind the front bottom teeth. 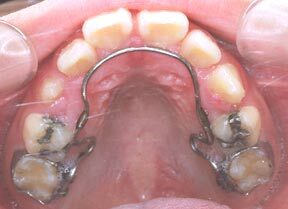 This issue was corrected with fixed braces. The treatment time was 8 months and the teeth on top are now in front of the teeth on the bottom. This cuspid, or canine tooth, did not erupt into proper position. A removable appliance was made to guide the tooth into its proper position. 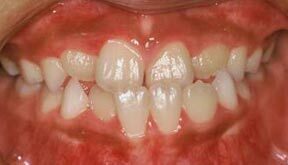 In this patient, the front right center tooth erupted too far forward. 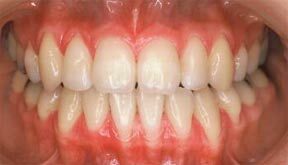 When this occurs, other teeth tend to shift into the space and cause problems. 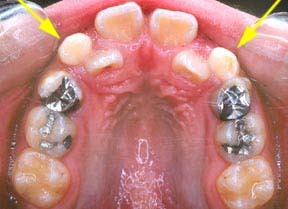 Space was created using a fixed appliance for the tooth, and the alignment is being maintained by a removable retainer until the last adult tooth, indicated by the yellow arrow, fully erupts into place. 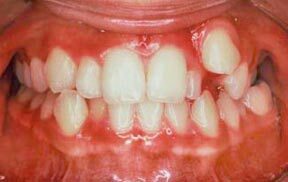 This is a good example of teeth erupting behind other teeth. 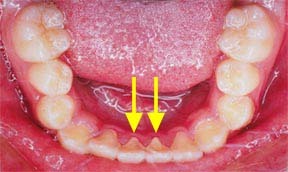 The yellow arrows indicate the retained baby cuspid teeth, which will be removed to make room for the lateral teeth, which will be pushed forward. After 8 months of treatment, the laterals are now in the correct position. They are being retained by a fixed retainer, which will be removed after all of the adult teeth have erupted into place. The two teeth with silver fillings are still baby teeth. 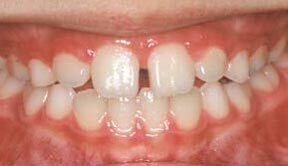 This patient's lower teeth were slightly out of alignment. 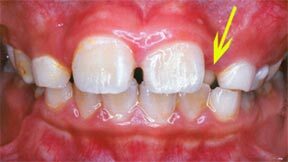 This is easily treated with a hidden retainer, meaning a retainer that is fixed to the inside of the teeth. Oral hygiene is very important at all times. The yellow arrows indicate the presence of tartar, and the gum tissue is red and irritated as a result. 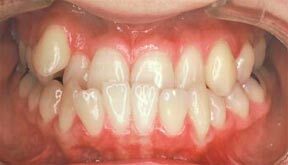 The alignment of the teeth is corrected with the the fixed retainer. The health of the gum tissue is greatly improved.